The RDR canal with Rangitata River, the shoulder of Mt Peel and the Tenehaun Conservation Area in the background. The RDR has been in operation since 1945, however it wasn’t until the late 1990s/early 2000s, under the Resource Management Act, that the management company was required to apply for a resource consent to install a fish screen on its two river takes, the Rangitata and South Ashburton branch. RDRML investigated the best technologies for excluding fish, predominantly migratory salmon and trout, from the RDR canal. At that time the invasive spread of Didymo or “Rock-snot” heavily influenced the decision not to install a physical screen - due to the risk of clogging. The company eventually decided to invest in a behavioural screen which produces a sensory repellent designed to make fish swim away into a fast-flowing bypass, returning safely to the river. “It was essential that the screen design had to be suitable for New Zealand conditions and consistent with the NIWA Fish Screening guidelines." 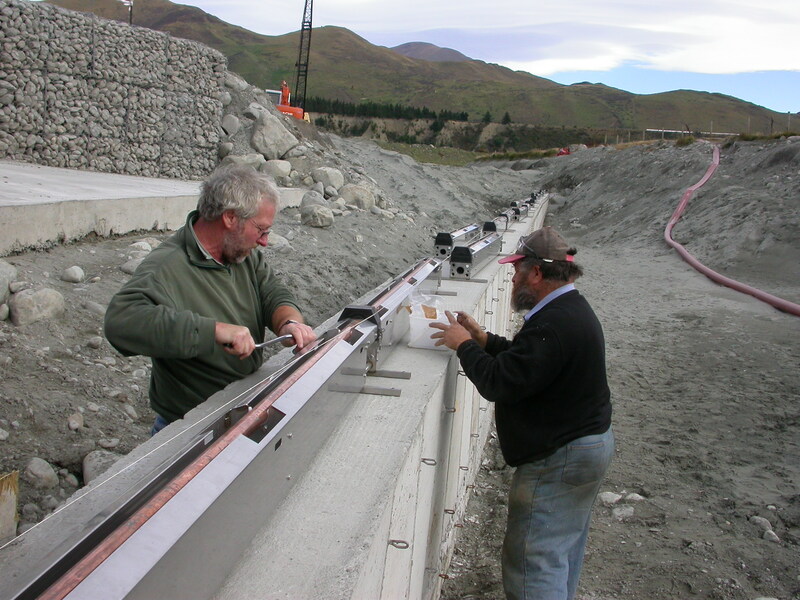 In 2007 BAFF, the first of its kind in New Zealand, was installed in the RDR canal approximately 2km downstream of the RDR point of water take from the Rangitata River. There were initial installation teething problems which resulted in a reinstallation and the system was finally commissioned in 2008. RDRML and Central South Island Fish and Game worked well together to trial and test the screen over the following couple of years. Results were not as expected which led to a comprehensive alteration of the bypass and the bypass flow. Better results were achieved, but they were disappointingly inconsistent. Further trials and adjustments to the screen hydrodynamics and the fish bypass followed over the next few years, however despite some excellent results, the average divergency efficiency was significantly below what RDRML had been promised by the screen manufacturers - and what had been understandably expected by the wider community. RDRML started investigating a better performing screen in late 2014, and in 2016 applied for consent in for a ‘rock bund gallery screen’, similar to ones used in other large flow irrigation systems. The design of the rock bund gallery screen did not gain universal support, indeed both Central South Island Fish and Game and the local Runanga, Arowhenua opposed it. In collaboration with other key stakeholders, RDRML then spent several months exploring alternative solutions, which ultimately led to a visit to California and Washington State in the USA to review screening practices. 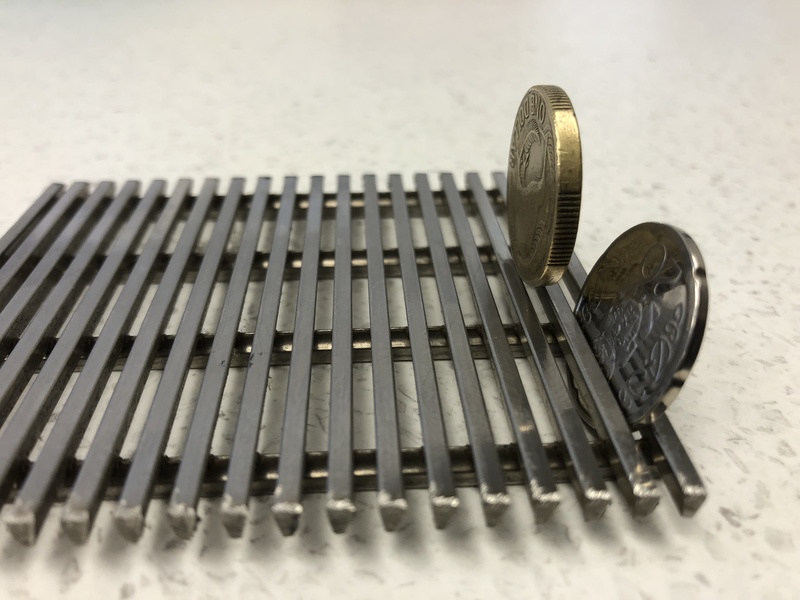 The experience and knowledge taken from the USA trip demonstrated that the best screening practice was achieved through the use of positive exclusion screens, with known design and performance characteristics. Given the volume of water carried in the RDR canal, and the challenges this poses to best practice fish screening, the replacement alternative required potentially brings with it a sizeable and costly infrastructure. RDRML lodged a new consent application in Jan 2018 for a rotary fish screen. Details of the engineering concept can be found here. The overall message received from the American visit was that both Federal and State fish screen authorities had over the years trialled a variety of fish screen technologies, including behavioural screens however these were deemed to be not as effective as physical (positive exclusion) screens. It is intended that the proposed screen beconstructed using 2mm wedge wire - this image demonstrates the aperture size. The screen would have a self-cleaning mechanism to keep it free from debris.